PARTICLE and ACTIVATED CARBON filter reduces pollen, dust, pet dander, mold spores, bacteria, odour, VOCs, Tobacco smoke and other gaseous pollutants. RECOMMENDED to change filter once every 6 months, or dependent on usage. This filter is eco-friendly and can be recycled after it's changed. Fresh air never looked so good. Bringing a customized splash of colour to your living space, this air cleaning powerhouse fits into any home environment. With a simplified and user friendly one-button control, select your fan speed (low, medium, or high) and let the Blueair Blue Pure 211+ take care of allergy causing pollutants and odours. Armed with three stages of filtration; colourful washable pre-filter, particle and activated carbon your household particles dont stand a chance. Clean up your air and create the best breathing space possible for you and your family (including the furry pet family members). All Blue Pure units come with a 1-year warranty by Blueair's award winning Customer Service team, simply register your new unit to extend to a 2-year warranty. Blueair combines the best in electrostatic and mechanical filtration technology. A revolutionary combination of advanced filter media and an encapsulated ion particle charging chamber makes it possible for the Blueair air purification system to achieve better results than either electrostatic or mechanical technology alone. Electrostatic/Mechanical Technology with 3-Stage HEPASilent filter captures 99.97% of airborne particles as small as 0.1 microns. The ionizer charges airborne particles with negative ions to make them cling more easily to the filter. This helps increase overall cleaning efficiency. No ozone is emitted. ENERGY STAR & AHAM certified and the quietest units on the market. Exchanges room air 5 times Per Hour. The Classic 205 is the next generation of the best-in-class Classic 203 air purifier, with an increased room size of 18 percent, it's ideal for rooms up to 279 square feet. Providing performance, you can count on, all Blueair purifiers are independently tested and verified by the Association of Home Appliance Manufacturers (AHAM) for Clean Air Delivery Rate (CADR), rated by ENERGY STAR, and tested by the California EPA Air Resources Board for no ozone emissions. It is recommended to replace the filter every 6 months, depending on use and environment. Blue Pure 411 Replacement Filter, Particle and Activated Carbon, Fits Blue Pure 411 The Blue Pure 411 Particle and Activated Carbon Replacement Filter protects against both gaseous and particulate contaminates. An activated carbon mesh layer eliminates harmful gaseous pollutants such as volatile organic compounds (VOCs), tobacco smoke, and other odours. In addition, advanced polypropylene filter media removes particle pollutants down to 0.1 micron in size from your indoor air, such as pollen, dust, and pet dander. Using a 360-degree air intake and up to 4 times the filter surface area than competing replacement filters, the Blue Pure 411 Particle and Activated Carbon Filter lasts longer, on average from 6 months to a year. The click-and-change filter is easily removed and replaced, and can be put into recycling at the end of its service life. Blue Pure 411 Replacement Filter, Particle and Activated Carbon, Fits Blue Pure 411 is rated 5.0 out of 5 by 7. Rated 5 out of 5 by LukeNukem from It’s a factory replacement that works as well as the... It’s a factory replacement that works as well as the original. Rated 5 out of 5 by Meg from Love this air cleaner. Runs smooth and looks cool.... Love this air cleaner. Runs smooth and looks cool. Rated 5 out of 5 by Ryan from Very reasonable price for a such a great filter. I love air purifiers and this is one my favorit... Very reasonable price for a such a great filter. I love air purifiers and this is one my favorites because of the low maintaince cost and the quietness of the filter. 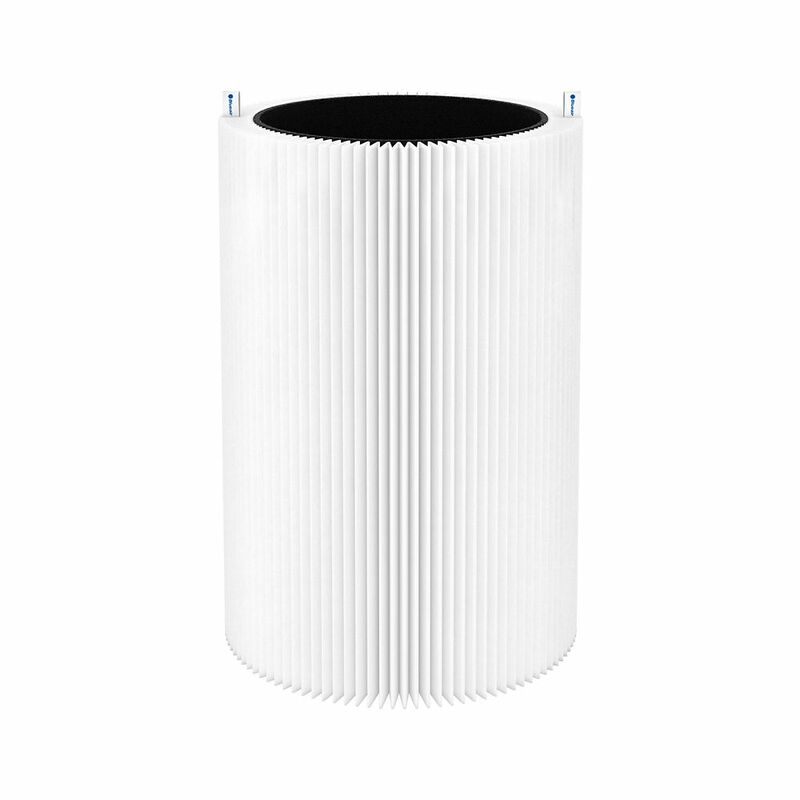 Rated 5 out of 5 by Cruiser from Very easy to replace filter. I love my Blue Air Purifier. I'm glad my local Home Depot has it in ... Very easy to replace filter. I love my Blue Air Purifier. I'm glad my local Home Depot has it in stock. Rated 5 out of 5 by Roxy from Works great. Easy to replace. Works great. Easy to replace.